Henry and I were so impressed when Diva gave us this filly sired by *Simeon Shai+. She has a very extreme head shape and is amazingly compact with such harmony and balance. In her yearling year she went to Mike Neals Training Center and then showed at the 2006 Egyptian Event. 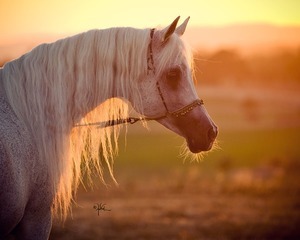 It was there that partners, Yuval Keller and David Vahnikin of BVK Arabians of Israel, approached Henry about buying her. She was exactly what they were looking for as a foundation mare and a show mare as well. That fall they came to visit SMF and decided tp complete the purchase. Shai Diva now calls Israel home and she has won Most Classic Head at the Egyptian Event there and placed as high as third overall in the Mares. 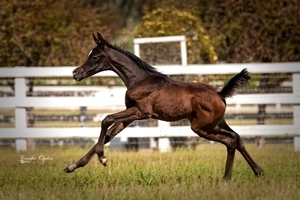 To date she has given them amazing foals by Nader Al Jamal, Simeon Sharav and Moundahaar Al Shaqab. She continues to pass her own unique qualities along with the sires' of her progeny. 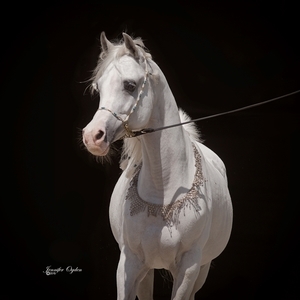 In 2013 her colt, Shadid BKV by Mundahaar Al Shaqab was third in his class at the Israeli Spring Show. At the same show her filly, Salma BKV by Mouhadaar BKV was Gold Champion Filly. At the October 2013 National Championships Shadid BKV was Yearling Bronze Champion Male and the Junior Silver Champion Female was Salma BKV. Shai Diva SMF also gave them a filly by Simeon Sharav named Sarai BKV. We are pleased that they are pleased!